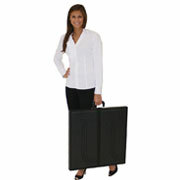 Briefcase displays are portable, folding table top presentations that set up easily and within seconds. Featured here are the three most popular brands on the market today — ShowStyle®, ShowMax® and Voyager™ — each with many options for accessories and graphics. 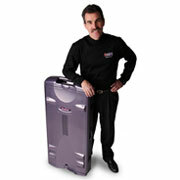 Want assistance in choosing the right brand of briefcase display for you? Contact us toll free at 1-855-536-3385 or by email. The original brand that defined ‘briefcase display’ is still	the best choice for a quality, portable tabletop presentation. Opening into a large, 6′ wide tabletop display, the ShowMax® is remarkably portable and easy to set up quickly. 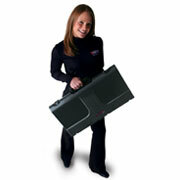 Specially designed for presentations on the go, these briefcase style tabletop displays are available in five sizes.